The Stamina 1215 Orbital Rowing Machine with Free Motion Arms is a compact and budget-friendly rower that is designed to make you feel as if you were actually rowing through water. The Free Motion Arms target your upper body, putting emphasis on toning and strengthening your arms, shoulders, core, and back, while the seat rests on a ball-bearing track this is perfect for working out your lower body. A rower such as this one is perfect for anyone looking to not only tone up but also work on their cardio as it is pretty easy to use and won’t break your bank. Add in the fact that it’s also storage friendly at only four feet long, 10 inches high when broken down, and only 52 pounds, and you’ve got yourself a rower that even those with limited space can use. This rower comes with a list of other features that truly adds to its appeal, such as its built in LCD display monitor. The monitor displays multiple things, such as time, row count, calories burned, speed, and distance “rowed”. Its steel construction promises to withstand the test of time, or at least its 5 year warranty, while the foam grips and cushioned seat help keep you comfortable while you sweat. With a weight limit of 250 pounds, this rower may not be for everyone, but it’s still a viable option for most beginners. It’s affordable at $259, and is generally well built. The machine itself is quiet, and is perfect for people with limited workout space. Also, it’s easy enough to use that beginners should have no problem starting a fitness routine with the Stamina 1215 Orbital Rowing Machine with Free Motion Arms. The free motion arms truly give the feeling that you are rowing through water. The frame comes with a 5 year warranty. Some buyers have reported problems with parts, mainly shocks and hydraulic pistons, breaking down after only a few weeks. However, a call to Stamina often resolved the issue with new parts being sent out right away. Speaking of parts, it IS a little unsettling that they only come with a 90 day warranty. Also, there have been a few customer complaints that the seats are not made sturdy enough to bear the weight and friction of the user and can become grooved over time. This creates a problem as the user can no longer row smoothly. As with any piece of equipment, there will issues that some people have and other’s don’t. In general, this is a decent rower for a decent price. The free motion arms are a true plus of the machine, and it’s compact build is rarely seen in this market. 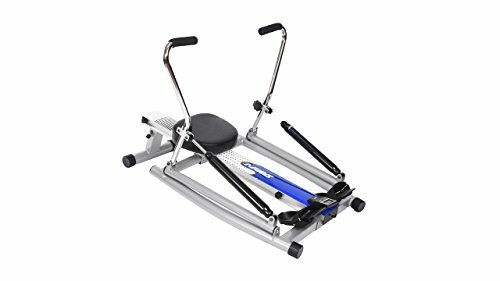 In general this is definitely a machine worth considering, especially for a beginner or anyone looking for a low-impact workout for their joints.